A four-stroke (also four-cycle) engine is an internal combustion (IC) engine in which the piston completes four separate strokes while turning the crankshaft, unkine two stroke engine which works on two cycle. A stroke refers to the full travel of the piston along the cylinder, in either direction. This type of engine works on otto cycle. Nikolaus Otto was the first person who demonstrated the four stroke engine in 1876. Intake: This stroke is also known as induction or suction. This stroke of the piston begins at top dead center (T.D.C.) and ends at bottom dead center (B.D.C.). In this stroke the intake valve must be in the open position while the piston pulls an air-fuel mixture into the cylinder by producing vacuum pressure into the cylinder through its downward motion. The piston is moving down as air is being sucked in by the downward motion against the piston. Compression: This stroke begins at B.D.C, or just at the end of the suction stroke, and ends at T.D.C. In this stroke the piston compresses the air-fuel mixture in preparation for ignition during the power stroke. Both the intake and exhaust valves are closed during this stage. Combustion: Also known as power or ignition. This is the start of the second revolution of the four stroke cycle. At this point the crankshaft has completed a full 360 degree revolution. While the piston is at T.D.C. (the end of the compression stroke) the compressed air-fuel mixture is ignited by spark plug forcefully returning the piston to B.D.C. This stroke produces mechanical work from the engine to turn the crankshaft. Exhaust: Also known as outlet. During the exhaust stroke, the piston once again returns from B.D.C. to T.D.C. while the exhaust valve is open. This action expels the spent air-fuel mixture through the exhaust valve. Intake: This stroke is the suction stroke . This stroke of the piston begins at top dead center (T.D.C) and ends at bottom dead center (B.D.C). In this stroke the intake valve must be in open position while the piston pulls an air fuel mixture into the cylinder by producing vacuum pressure into cylinder through its downward motion. The piston moves down as air is sucked in by the downward motion against the piston. Compression: This stroke begins at bottom dead center, and ends at top dead center. The piston compresses the air fuel mixture. Both intake and exhaust valves are closed during compression stroke. Combustion: This is sometimes referred as power stroke as the power is generated during this stroke. 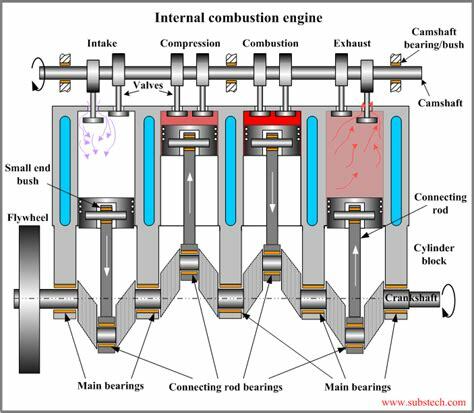 At this point there is 360 degree rotation of crankshaft While the piston is at top dead center the compressed air fuel mixture is ignited by highly compressed air ( hot air) resulting the piston to return at bottom deck center. There is no spark plug to ignite fuel as it is not necessary in this case. This stroke produces power that’s why name is power stroke which is used to rotate the crankshaft. Exhaust: Last part of 4 stroke. During exhaust stroke the piston once again returns from bottom dead center to top dead center while the exhaust valve is open. This action suspends the air fuel mixture through exhaust valve in the form of gases. Note: The basic difference between 4 stroke petrol engine and 4 stroke diesel engine is the burning of air fuel mixture. In petrol engine it is ignited by spark plug and whereas in case of diesel engine it is due to highly compressed air( hot air) and no spark plug is present. Widely used in automobile industry. 4 stroke engine has higher torque at lower rpm as compared to 2 stroke engine. More fuel efficient than 2 stroke engine. It creates less pollution as no oil is burned during combustion. 4 stroke engine lasts longer than 2 stroke engine as 2 stroke engines are designed for high rpm and at high rpm engines wears at faster rate hence less durable. It has a separate oil chamber. It has more reciprocating parts which ultimately leads to complicated design. Power generation is somewhat less than 2 stroke engine as power gets delivered once every 2 rotations of crankshaft.